Wilhelm J. Krüger (Krueger) was born 21 Jan 1835. We don’t know exactly where he was born, but based on the clues we have it is possible he was born near the town of Kahlen in Kreis Cammin, Pommern, Prussia. It was a part of Germany at that time, but is now located in Poland and is called Kaleń, Poland today. This photo of Wilhelm and Caroline is courtesy of Lloyd O. Krueger. From her burial record from Grace Lutheran Church in the Town of Maine, Wisconsin, we know that Caroline Wilhelmine Florentine Hoge was born 18 Jun 1836 in the town of Stuchow, Kreis Cammin, Pommern, Prussia. It is called Stuchowo, Poland today. According to the 1900 census, they married in 1857 in Prussia, and had five children. Their first child, Heinrich Friedrich Wilhelm Krueger, and another son, Carl Bertold Krueger, survived. Three other unknown children did not. According to family legend the Kruegers were farmers and raised animals. They were said to have been “as poor as church mice”. According to family legend, their eldest son Heinrich stowed away aboard a ship and came to the US in 1882 to avoid being conscripted into the Kaiser’s army. The other son Carl followed in an identical manner later in 1882 or in 1883. According to census records, Caroline and Wilhelm arrived soon after their son Carl did, in 1883. 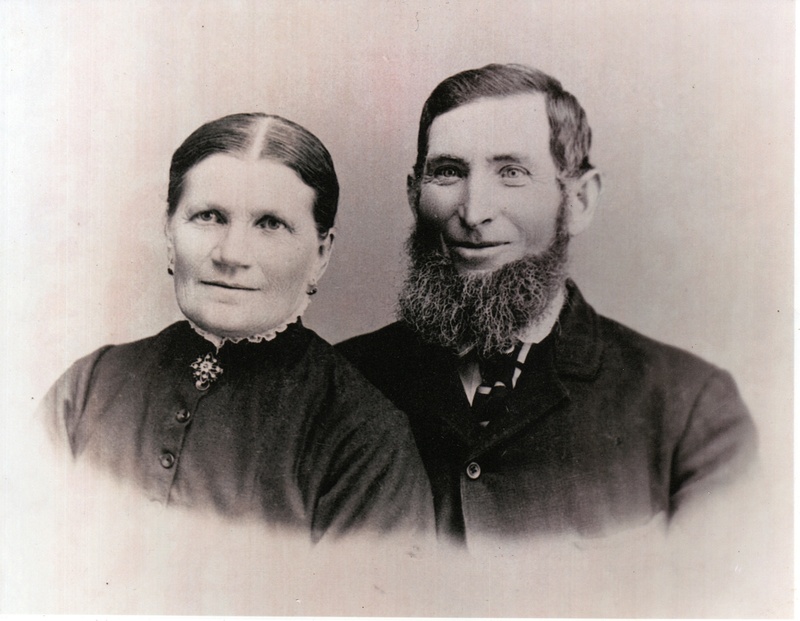 The family settled on a farm in the Town of Maine (near Wausau, Wisconsin) at first, but Heinrich and his bride Bertha Kamrath moved into Wausau while Wilhelm, Caroline, and Carl lived on the Krueger family farm in the Town of Maine. Wilhelm was one of the founders of the Andrew-Grace Lutheran Church there. Caroline died on 5 Oct 1917 from pneumonia. She was buried in the Town of Berlin Cemetery (west of Wauasu, Wisconsin) just down the road from the family farm. Wilhelm was buried next to her after his death on 16 Mar 1926. 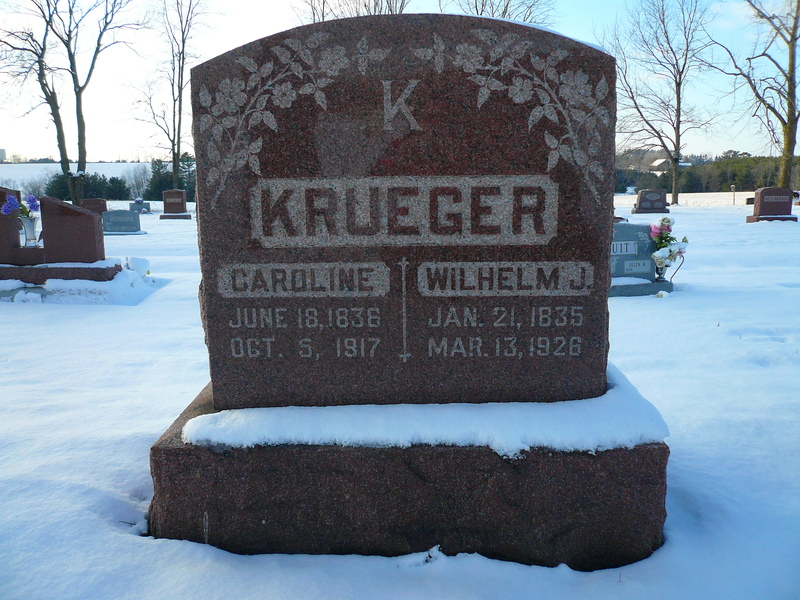 Krueger Grave in Town of Berlin Cemetery, Marathon County, Wisconsin. Carl Bertold Krueger was born 3 Jul 1864. Based on information he gave in his marriage record (“Kalem, Provinz Pommern”), we guess he was born in or near Kahlen, Cammin, Pommern, Prussia. About 1883, Carl followed his elder brother Heinrich’s example and stowed away aboard a ship to come to the US. According to his granddaughter LaVila Krueger Luedtke, Carl hid on board until he was far enough away from the port that he knew the would not turn around. Then revealed himself and he worked his way across the Atlantic in the ship’s kitchen. The last few days of the voyage there was so little food that only the children were allowed to eat… and oatmeal was the only food left. So each morning Carl would announce in German: “Haferflocken für der kinder!”. Oatmeal for the children (only). His wife, Bertha Albertine Wilhelmine Strehlow, was born 13 Dec 1862 in Wandhagen, Kreis Schlawe, Pommern, Prussia. 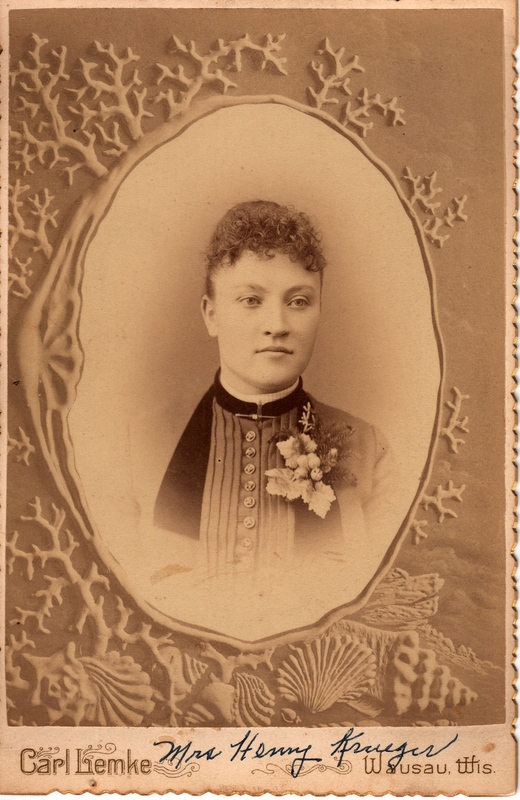 She came to the US when she was five years old traveling from Hamburg, Germany and arriving in New York on 6 Jun 1868 aboard the “Tutonia” with her mother, Wilhelmine Schwarz, her brother Herman, and her Uncle August Strehlow, who was a carpenter like many men in the family. They settled first in Polk, Washington County, Wisconsin, then moved to the Town of Maine, Wisconsin when Bertha was 11 years old in 1873. 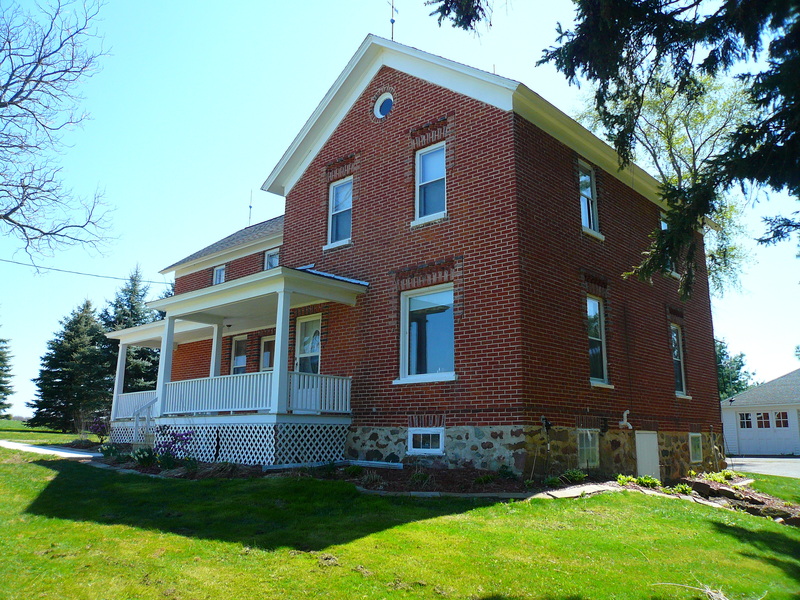 The Krueger family farm actually touched the Strehlow family farm in one corner, so according to their grand-daughter LaVila Carl and Bertha met simply by “leaning over the fence”. 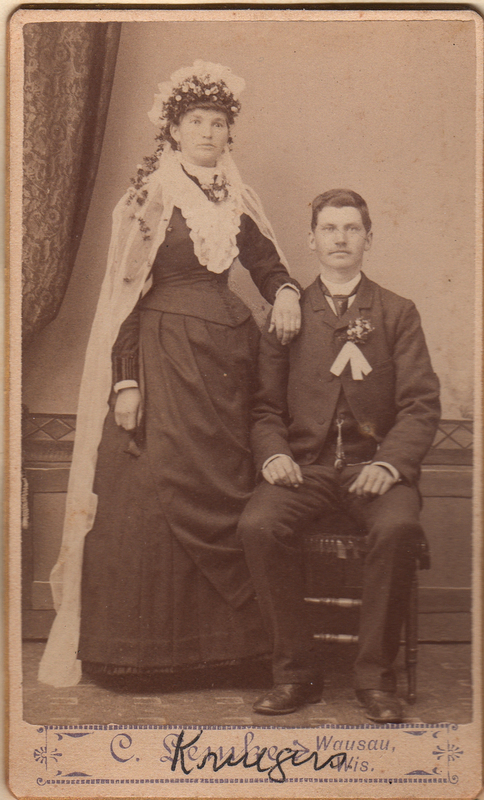 They were married at Grace Lutheran Church in the Town of Maine on 10 Dec 1886, the day the attached photograph was taken. Carl was 22, Bertha was 23. They lived in the Town of Maine and had six children, four of whom survived childhood. Photo courtesy of LaVila Krueger Luedtke. Carl was a bricklayer and build the parsonage across the road from Grace Lutheran Church in the Town of Maine (where the current Pastor Nate Biebert still resides). He also built the foundations of many barns in the area and boasted to his family of having built the brick houses along Highway K in the Town of Maine. The Grace Lutheran Parsonage. Brickwork was done by Carl Krueger. Bertha died of pneumonia on 6 Feb 1931 and was buried in the Town of Berlin Cemetery. Carl lived with his son William until his death on 3 Feb 1949 when he was buried alongside his wife. Heinrich Friedrich Wilhelm “Henry” Krueger was born 31 Dec 1857. As with the rest of his family, our best guess that he was born near Kahlen, Kreis Cammin, Pommern, Prussia. Henry grew up as the eldest son of farmers of very modest means. In 1882 family legend says that he stowed away aboard a ship and came to the US to avoid fighting in the Kaiser’s wars. He was 25 years old. His parents and brother followed him to the US in 1883, and the family at first settled on a farm in the Town of Maine just outside Wausau, Wisconsin. Eventually, Henry moved into the city of Wausau and, according to his grandson Lloyd Krueger, he “worked in the saw mills as a millwright, developing new machines to keep pace with the progress in the veneer mills and to keep those in existence running”. For a good part of his career, Henry worked at the Underwood Veneer Mill on the South side of Wausau. At other points he worked as far away as Stevens Point, and only came home on weekends to see his family. Bertha Augusta Wilhelmine Kamrath was born 3 Aug 1864 in Pommern, Prussia. Her place of birth is still uncertain. The passenger list for her voyage to the US mentions a town called Wandau or Wansau in Pomerania. Her sister said “Stettin”, so it may be a small town near there. Bertha and Heinrich had known each other in Prussia, according to family lore, and after Henry was established in the US, Bertha and her family immigrated as well. 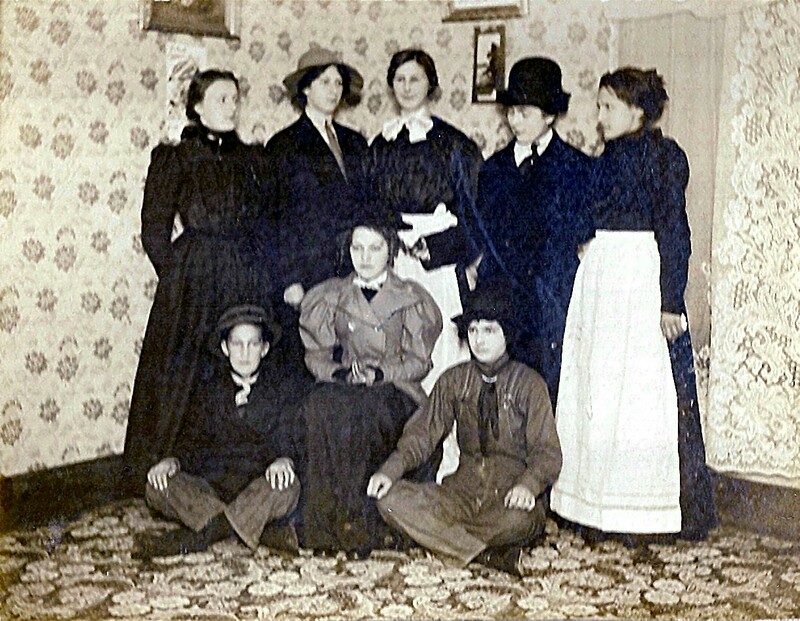 Bertha, her parents, and three of her siblings boarded a ship called the “Hammonia” in Hamburg, Germany on 3 May 1885. Eleven days later on 14 May 1885, the Hammonia pulled into New York harbor. It was 4:00am and the Kamrath family beheld the bright lights of the biggest city they had ever seen. They were about to begin a new life in the United States. Bertha Kamrath, shortly after her arrival in the US (c 1885). 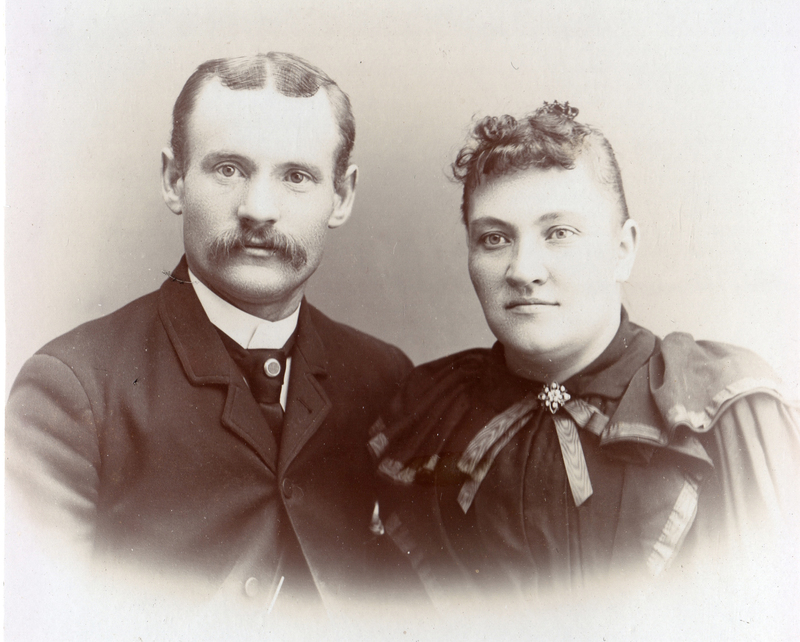 Henry and Bertha were married in a German ceremony at Grace Lutheran Church in the Town of Maine on 20 Dec 1890. Henry was 32, and Bertha was 26. The attached photo was likely taken at or around that occasion. Photo courtesy of Harvey Krueger. They had 12 children total, 8 of which survived childhood. Their eldest son Arthur Krueger was killed in the last battle of World War I fighting alongside his brother Oscar. He died in the Battle of the Argonne Forest, one week before the end of the war. After escaping Prussia to avoid fighting in the Kaiser’s wars, Heinrich had to cope with his eldest son being killed in a war against Germany. Their other surviving children were Oscar, Agnes, Elsa, Norma, Edmund, Lawrence, and Alfred. Henry and Bertha had a small home on 3rd Avenue North, and later built a larger home at the same location. Henry worked in the saw mills, then later as a carpenter in Wausau building houses. He enjoyed building lawn ornaments in his wood-shop. Bertha raised their children, planted beautiful flower beds around their home, and was active in many church groups. 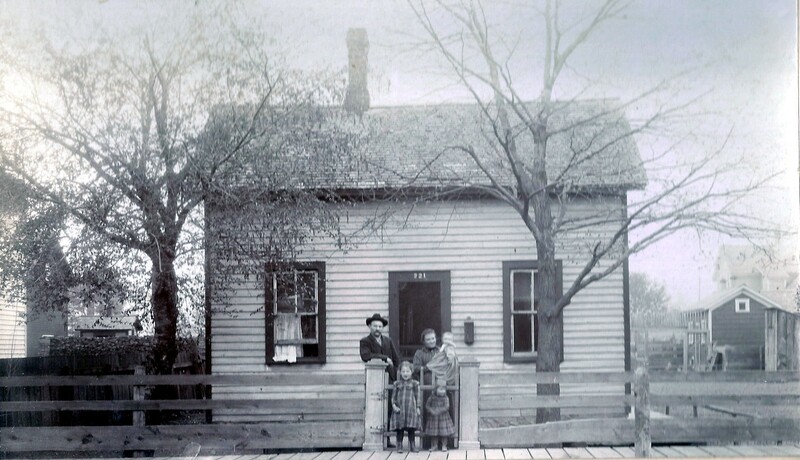 Henry & Bertha in front of the original home at 221 3rd Ave. North in Wausau (c 1903). Bertha passed away from cancer on 29 Mar 1928. Henry lived with his son Edmund until his peaceful death on his 88th birthday, 31 Dec 1945. After a large meal with his family he was preparing to go home and sent his granddaughter to get his boots. By the time she returned with them he had had a sudden heart attack and had slipped away. Heinrich Krueger and Bertha Kamrath are buried in Pine Grove Cemetery in Wausau, Wisconsin next to their sons Arthur and Lawrence. I’ve been in touch with Mollie Crain, who is related to the Synotts. She sent me copies (by snail mail) of family records that she has and included a tree copy for you. I opened it tonight and found something from the UWSP Archives in Steven’s Point. Apparently there was a Wausau centenniel project in 1939 and William Synott and Ida filled one out. In it, Ida says that she was born May 5, 1978 in Stettin, Germany! Also, she lists her siblings and fails to mention Bertha (!!!) although she mentions Helen (John) Tisch born 29 July 1866, living in Tacoma, WA; Anne Petra [Petrie] born 12 June 1868 and living in Marinette, WI; Emma (August) Oelke born 5 August 1870 and living at 225 3rd Avenue North; Carl Kamrath (dead). The “Stettin” listed is likely not the town of Stettin, but rather the District of Stettin in Pomerania. There are two towns called Roggow in the District of Stettin, Pomerania. I’m not sure which one was the place listed on the Kamrath passenger list yet, but Stettin is a huge port city and it would have been easy for Carl and Henry Krueger to stow away aboard a ship there assuming the Kruegers also lived relatively near to that city. She didn’t know anything about the Krueger origins apart from the fact that they were from Pomerania. She never heard a town mentioned. I heard back today from Cheryl Krueger Hein (b 1943), who is the daughter of Alfred Heinrich Krueger (1908 – 1994), Henry Krueger and Bertha Kamrath’s youngest son. Alfred was, therefore, my great-granduncle and brother to my great-grandfather Oscar Krueger. Cheryl was polite but said that she really didn’t know much about her family because she moved away right after high school and lost touch with just about everyone except her cousin Loris Voigt Dustin. “Living 1500 miles from your immediate family, you do lose contact.”, she explained. 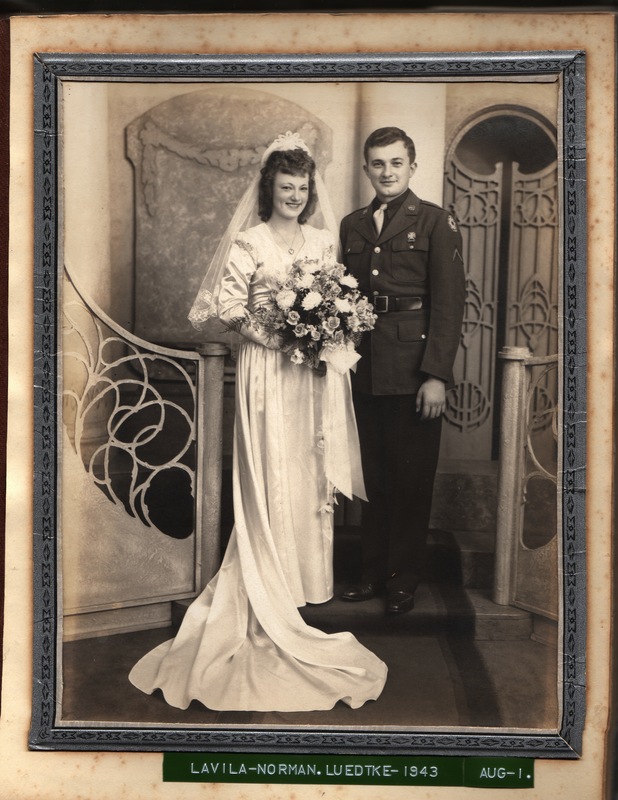 Nevertheless, she gave me a lot of good information, including information about her mother Rachel I. Fry (May 1912 – 1998), whom Alfred married about 1932 and divorced about 1957. I did not have a name for Alfred’s wife at all, so that was quite valuable. I’m going to see if she’s amenable to further questions and also see if she has any family photos I could convince her to share with me. Will update as that goes forward. She also told me that the “dress up” photo with the Oelke girls was taken in Bertha Kamrath Krueger’s living room. Very exciting!